2 tablespoons of Jethro’s Cajun Lime & Jalapeno Marinade. Add the sweet potatoes to a large pan of boiling water and simmer until tender, drain in a colander for a minute then pop back into the empty saucepan. Add salt and pepper to season, then mash. While the sweet potatoes are simmering, heat 1/2 tbsp. of coconut oil in a large frying pan over a high heat. Add the mince and fry until just cooked. Then transfer the mince to a bowl. Heat another 1/2 tbsp. of coconut oil over a medium heat. Add the onion, courgette, red pepper and carrots and stir fry for approximately 5 minutes until starting to soften. Add the mince beef back into the vegetables. Mix in the tomato puree, water and Cajun Lime & Jalapeno Marinade. Mix. Add 1 tbsp of plain flour to thicken the sauce. Mix well and simmer for 15-20 minutes. Remove from the heat add the frozen peas. 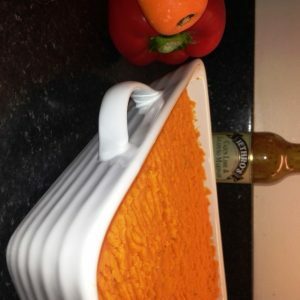 Empty contents into a large, uncovered, baking dish and top with the mashed sweet potato. Bake the cottage pie in a pre heated oven at gas mark 6 (200 degrees) for around 20 minutes and serve.